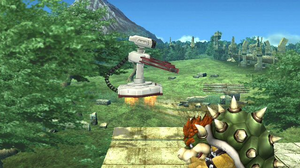 A R.O.B Sentry hovers over Bowser. A R.O.B. Sentry (ロボットアタッカー, Robot Attacker) is a member of the R.O.B. Squad and an enemy in the Subspace Emissary mode, encountered only on the Isle of the Ancients. The R.O.B. Sentry commonly appears on the floating island, hitting opponents with their arm in a fashion similar to R.O.B. 's forward tilt. According to the trophy description for R.O.B. Blasters, R.O.B. Sentries are equipped with beam firing capabilities, although they choose to participate in hand-to-hand combat. In addition to defending the Research Facility and the Subspace Bomb Factory, the R.O.B. Sentries served a vital role in Tabuu's plot. Whenever the Ancient Minister dropped one of the Subspace Bombs, two R.O.B. Sentries are required to arm it, being sacrificed in the subsequent explosion. The R.O.B. Squad was initially under the command of the Ancient Minister, but during an attack on the Subspace Bomb Factory, Ganondorf took control of them, forcing them to even attack the Ancient Minister. This cutscene is the only time R.O.B. Sentries can be seen using their beam firing ability. The R.O.B. Sentry trophy in Brawl. This page was last edited on June 5, 2017, at 07:08.